CM: Christos Antonaropoulos presents herewith the portrait of his mythical hero, Pyrofantes. The name 'Pyrofantes' is composite, and means the one who reveals fire, that is the one who carries the knowledge of technology to man. Pyrofantes is the mediator who transfers wisdom from the gods to the people. The portrait's focal point is the eyes, which have been erased. This is a reference to the tendency of people of other religions to erase at least the eyes from venerated faces on frescoes as a gesture emblematic of sacreledge. The eyes of course are on the one hand the most expressive part of the body, while on the other they are the most important means by which to perceive the world. Antonaropoulos created the portrait of Pyrofantes as a "fresco excerpt from his temple". 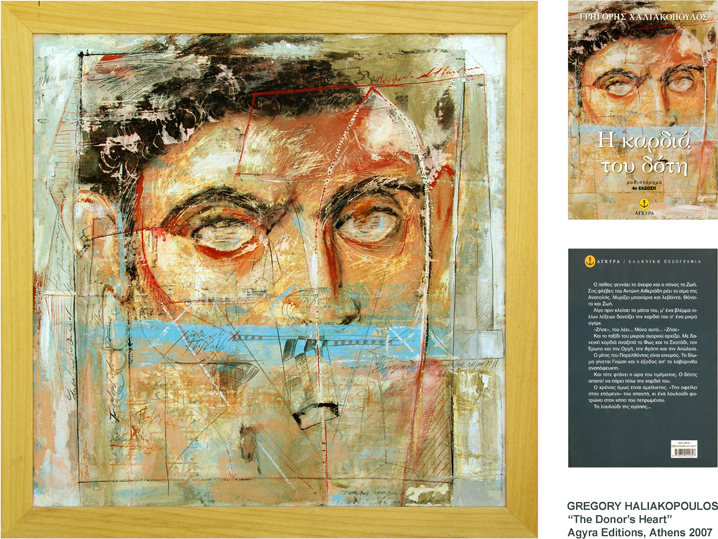 There is a clear reference to the portraits of the Fayoum region. The stuccoed canvas used by the artist creates the impression of historic wall painting. The final outcome is one of multiple interventions, which create a rich layering of colors. This is the visual solution that Antonaropoulos employed in order to describe the influence of time on the picture and through the picture on the object. On the portrait are applied a plethora of graphic elements - random or automatistic drawings and patterns - which either comply or resist the portrait's harmonious composure. These elements endow the work with various levels of appearance, of which some are fertile in enlightening it, while others are complimentary in de-constructing it. Though it may seem peculiar, Antonaropoulos aims for the beholder to observe elements that the artist was not conscious of including in his work. According to Antonaropoulos "a work of art is multifaceted and - as such - should be left open and discharged of a particular approach". The portrait in contemporary art is the pretext and not the end. Through portraiture the artist is able to make his own comment on the history of art. In this instance, the portrait of Pyrofantes is based on the reality of fiction. Antonaropoulos has said characteristically: in my work I document that which remains after I forget all I know". In this sense, Pyrofantes is only the distillation of the feel that the author dreamed of him. Antonaropoulos' Pyrofantes adorns the cover of Gregory Haliakopoulos' novel The Donor's Heart of 2007.